As she turned the pages of Iowa Alumni Magazine, Mary Lee Duda paused, gazed in disbelief, and then peered more closely. Yes, it was definitely her face smiling out from a 1960s-era photo of Hawkeye cheerleaders forming a human pyramid. Mary Lee*, 61BA, didn't know it then, but this chance encounter with her younger self gave the final push to a project that benefits future Iowa cheerleaders. Her husband, Fritz, had been contemplating making a gift to support the UI Spirit Squad in his wife's honor, and the nostalgic magazine photo helped make up his mind. With help from UI Foundation and UI Athletics staff, Fritz arranged a $1.5 million gift to the squad-and a big surprise for Mary Lee. Even though the Dudas have lived in Texas for years, Mary Lee still considers Iowa City home. It's where her family, the Nagles, cultivated businesses in lumber and banking, and it's where she developed unshakeable loyalty to the UI. "Our family calls her 'The Cheerleader,'" says Fritz, "and jokes that she still tapes her ankles for every Iowa game." Last season, the whole Duda family secretly collaborated on a plan to get her to the 2010 Homecoming game-and onto the field at Kinnick Stadium. There, along with 70,500 Hawkeye fans, she learned of the Mary Lee Hawkeye Spirit Fund and saw herself on the Jumbotron. Remembering her own days as a cheerleader, Mary Lee recalls the uniform of heavy wool sweaters and skirts-and lots of fun and friendship. "We didn't practice as much as they do now," she says. "These kids spend so much time and effort on cheerleading, yet they're not often recognized." The Mary Lee Hawkeye Spirit Fund provides student aid, uniforms, and training to give Iowa's cheerleaders, dancers, and mascots the appreciation and support they deserve. As Mary Lee recovered from the shock announcement, members of the spirit squad demonstrated their gratitude by lifting her high into the air. "It was terrifying at first, because I hadn't done anything like that for 45 years," she says, "But once I got up there, I felt as if I could conquer the world." She's certainly won the hearts of Iowa fans and athletes. 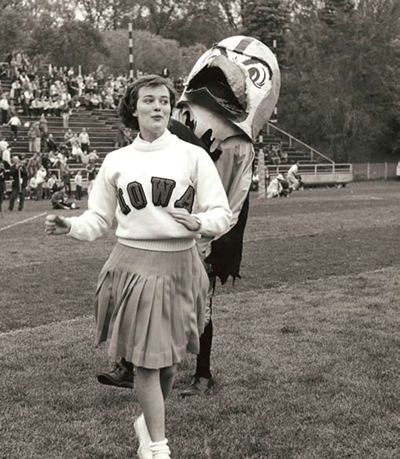 It just goes to show that, even without pom poms, Mary Lee Duda still knows how to raise Hawkeye spirit.